Let’s face it, more and more consumers are paying with credits which means credit card receipts in your business are growing! Even with the recent credit card fraud issues, it’s still one of the most popular ways to pay for something. Along with that, clients don’t use the same credit card carrier. This means companies have to accept multiple card types such as American Express, Visa and Master Card. When those credit card receipts show up in Microsoft Dynamics GP, they unfortunately are not in specific order. 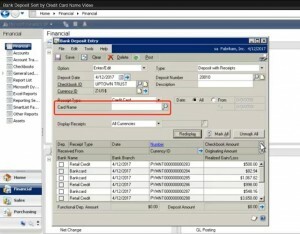 This can make the process of reconciling your credit card statement in Microsoft Dynamics GP time-consuming. There is an enhancement for Microsoft Dynamics GP called Bank Deposit Sort by Credit Card that can easily help solve this. The Resource Group modified the Bank Deposit window slightly in Microsoft Dynamics GP, allowing you to filter the list of credit card receipts displayed in the Bank Deposit window by the name of that card. Watch this quick 3-minute demonstration to see how you can effortlessly reconcile the total deposit amount for each credit card by name to the bank statement. To learn more about the Bank Deposit Sort by Credit Card Name for Microsoft Dynamics GP, please contact The Resource Group.